While it may seem like kids grow up too fast, evolutionary anthropologists see things differently. Human childhood is considerably longer than chimpanzees, our closest-living ape relatives. A study by Tanya Smith (Harvard University and Max Planck Institute for Evolutionary Anthropology), Paul Tafforeau (European Synchrotron Radiation Facility) and colleagues in the November issue of the Proceedings of the National Academy of Sciences USA found a similar pattern when human kids are compared to Neanderthals. A multinational team of specialists applied cutting-edge synchrotron X-ray imaging to resolve microscopic growth in 10 young Neanderthal and Homo sapiens fossils. They found that despite some overlap, which is common in closely-related species, significant developmental differences exist. Modern humans are the slowest to the finish line, stretching out their maturation, which may have given them a unique evolutionary advantage. Scientists have been debating whether Neanderthals grew differently than modern humans for decades. An ambitious project on the development of these archaic humans was launched by Jean-Jacques Hublin and colleagues at the Max Planck Institute for Evolutionary Anthropology (MPI-EVA). A remarkable finding of this five-year study is that Neanderthals grow their teeth significantly faster than members of our own species, including some of the earliest groups of modern humans to leave Africa between 90-100,000 years ago. The Neanderthal pattern appears to be intermediate between early members of our genus (e.g., Homo erectus) and living people, suggesting that the characteristically slow development and long childhood is a recent condition unique to our own species. This extended period of maturation may facilitate additional learning and complex cognition, possibly giving early Homo sapiens a competitive advantage over their contemporaneous Neanderthal cousins. Evolutionary biology has shown that small changes during early development may lead to differences that result in new species. These changes may take the form of modifications in the sequence or timing of developmental events; thus understanding developmental transformation is key to reconstructing evolutionary history. Anthropologists have documented many differences in adult characteristics among closely related species, such as humans and chimpanzees. Genomic data combined with fossil evidence indicate that these two lineages split six to seven million years ago, and have since been evolving separately. However, we know much less about which changes led to the separate lineages, how these changes arose, and when they occurred. Research during the past two decades has shown that early fossil humans (australopithecines and early members of the genus Homo) possessed short growth periods, which were more similar to chimpanzees than to living humans. However, it has been unclear when, and in which group of fossil humans, the modern condition of a relatively long childhood arose. One poorly understood change is our unique life history, or the way in which we time growth, development, and reproductive efforts. Compared to humans, non-human primate life history is marked by a shorter gestation period, faster post-natal maturation rates, younger age at first reproduction, shorter post-reproductive period, and a shorter overall lifespan. For example, chimpanzees reach reproductive maturity several years before humans, bearing their first offspring by age 13, in contrast to the human average of 19. It might seem that life history is invisible in the fossil record, but it turns out that many life history variables correlate strongly with dental development. “Teeth are remarkable time recorders, capturing each day of growth much like rings in trees reveal yearly progress. Even more impressive is the fact that our first molars contain a tiny ‘birth certificate,’ and finding this birth line allows scientists to calculate exactly how old a juvenile was when it died” says Smith. This forensic approach to the past is possible with a ‘super-microscope:’ extremely powerful X-ray beams produced at the European Synchrotron Radiation Facility (ESRF) in Grenoble, France, which is one of the largest synchrotrons in the world. A synchrotron is a machine that produces beams of light from accelerated electrons deviated by magnetic fields. Depending on the energy, the light spectrum may range from radio frequencies to high-energy X-rays (hard X-rays). This type of light source allows scientists to image fossils more efficiently and with addition imaging techniques than medical or industrial laboratory X-ray sources. The process of imaging teeth involves taking a series of X-ray images while the sample rotates, which are transformed by software into cross-sectional slices that reveal internal structure, and can be modeled in three-dimensions (Video demonstration shown on the right). Tafforeau notes: “At the ESRF, we are able to look inside invaluable fossils without damaging them by using the special properties of high energy synchrotron X-rays. We can investigate fossils at different scales and in three-dimensions, ranging from studies of overall 3D shape down to microscopic daily growth lines. This is currently the only place where these studies of fossil humans are possible.” Scientists and curators have been quietly visiting the French synchrotron, often with some of the rarest hominin fossils in the world, for imaging with this state-of-the-art technique (See Figure 1 below & Video 1 on the right). Team members in the ESRF experimental hutch with the 90-100,000 year old Israeli Homo sapiens skull from Qafzeh Cave (center). This remarkable 5.1 year-old was found buried at the feet of an adult female, and it is believed to be one of the earliest instances of intentional burial. Video 1 (right) is a 3D Animation of what the synchrotron revealed inside the child. From left to right: Paul Tafforeau, Assaf Marom, Tanya Smith, Jakov Radovcic, Almut Hoffman, and Jean-Jacques Hublin. The study by Smith, Tafforeau and other specialists includes some of the most famous Neanderthal children, including the first hominin fossil ever discovered (See Figure 2 below and Video 2 on the right). This Belgian Neanderthal child, discovered in the winter of 1829-1830, was thought to be 4-5 years of age when it died. Powerful synchrotron X-rays and cutting-edge imaging software revealed that it actually died at a mere 3 years of age. Another invaluable Neanderthal discovered in Le oustier, France in 1908, barely survived the shelling of its’ German repository during the Second World War (See Figure 3 below). Studies by Smith, Tafforeau and other scientists at MPI-EVA are adding to the growing body of evidence that subtle developmental differences exist between us and our Neanderthal cousins. Forthcoming work in Current Biology reports that brain development also differs between Neanderthals and modern humans. Moveover, the recent sequencing of the Neanderthals genome by MPI-EVA molecular biologists has provided tantalizing genetic clues that point to differences in cranial and skeletal development between Neanderthals and modern humans. These new methods present a unique opportunity to assess the origins of a fundamentally human condition: the costly yet advantageous shift from a primitive “live fast and die young” strategy to the “live slow and grow old” strategy that has helped to make us one of the most successful organisms on the planet. Smith, T.M., Tafforeau, P., Reid, D.J., Pouech, J., Lazzari, V., Zermeno, J.P., Guatelli-Steinberg, D., Olejniczak, A.J., Hoffman, A., Radovčić, J., Masrour, M., Toussaint, M., Stringer, C., Hublin, J-J. (2010) Dental evidence for ontogenetic differences between modern humans and Neanderthals. Proc. Natl. Acad. Sci. USA. 107:20923-20928. 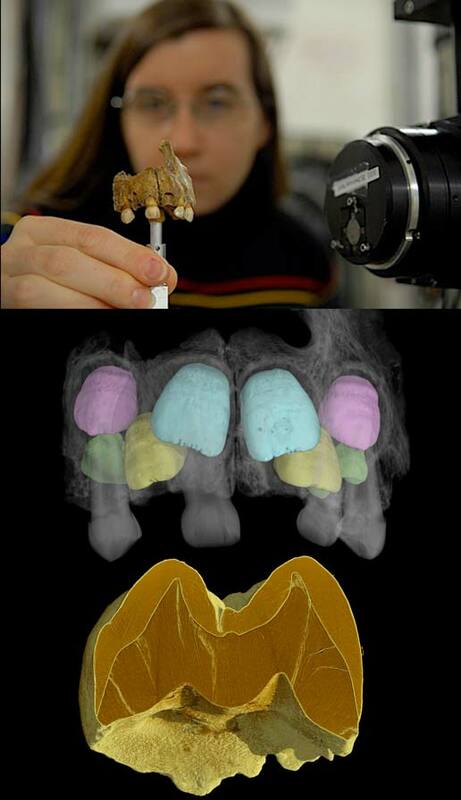 Virtual imaging of a 30-90,000 year old tooth from Equus Cave, South Africa scanned with synchrotron imaging (16 micron voxel size). Cross-sectional slices beginning at the top of the tooth reveal the enamel (light-colored tissue), internal dentine (darker tissue), and subtle microcracks in the fossil lower first molar. Sophisticated engineering software is used to reconstruct the three-dimensional shape of the tooth, and to segment (separate) and measure the volume of the enamel (colored yellow) and dentine (colored blue). The final images reveal the three-dimensional distribution of tooth enamel, which grades from relatively thin (yellow) to thick (red). Multi-scale synchrotron imaging of the 90-100,000 year old fossil Homo sapiens child from Qafzeh Cave in Israel. The lower jaw was scanned at 31 micron voxel size, and shows the deciduous dentition, erupted permanent first molar, and developing tooth germs inside the jaw. The close-up of the first molar (7.5 micron voxel size) shows horizontal growth lines (perikymata) on the outside of the tooth and marked internal growth lines (as well as chemical modification after death). The tiny 1 mm by 1 mm cube of enamel (scanned with 0.7 micron voxel size) shows the fundamental rod-like building blocks of tooth enamel (enamel prisms), and fine banding that represents daily growth lines (cross-striations). The skeleton was originally found at the feet of an adult female skeleton, and is believed to be one of the earliest instances of intentional burial. Multi-scale synchrotron imaging of the 30-50,000 year old Neanderthal child from Engis Cave in Belgium. The upper jaw (maxilla) and lower first molar were scanned at 31 micron voxel size. The permanent teeth are visible inside the maxilla, and are virtually sectioned to show the degree of development at the time of death. The close-up of the upper first molar (5 micron voxel size) shows different variables used to calculate the age at death, as well as growth lines (perikymata) on the outside of the tooth. The 1 mm by 1 mm cube of enamel (scanned with 0.7 micron voxel size) shows long-period growth lines (Retzius lines) running to the tooth surface on the right, and fine banding that represents daily growth lines (used to determine the number of days between Retzius lines, also known as the periodicity). This information can only be obtain from the inside of a tooth, and allows scientists to determine that the individual died at precisely 3 years of age. Fossil courtesy of the Université de Liège.